Paper Dosa is a very popular South Indian breakfast. I got this recipe from a FB group. This was in my to-do list from a very long time. Finally I decided to make it and tried it for the first time and absolutely loved it. The dosa turned out very crispy and trust me its worth trying. You can also try making my first version of Paper Dosa. Soak rice, split green gram and urad dal for 3-4 hours. Grind them together to get a fine paste (don't make it watery). Keep the batter to ferment for 8-9 hours. Mix all purpose flour and rice flour in a bowl. Add water as required and mix it properly to remove all the lumps. Add this paste to the fermented batter. Mix it well. 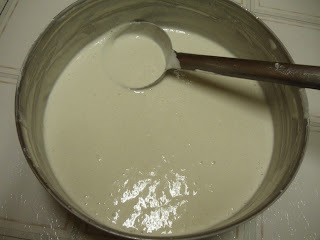 Add salt and adjust the consistency of the batter. It should be medium thick. Heat the pan (medium heat). Pour one full ladel and spread the batter (as thin as possible) in circular motion and close it with a lid for few seconds. Open the lid and spread oil on the dosa. Once the dosa starts to turn golden brown, transfer it on a plate. Serve it hot with coconut chutney or any spicy curry of your choice. Above measurement serves 3-4 people. Thanks Coral Crue. Let me know how it turned out. Addition of mung dal doesn't change the taste in anyway. Addition of rice flour and maida makes it very crispy. You can also use whole urad. You needn't decrease the amount. I would suggest using raw rice. I am not sure whether par boiled rice works. But you can always experiment :) let me know if you give it a try. I would love to hear back. Sorry for the delay in reply. what pan do you use ? You are really a dosa expert! They look really so hotel like! Also will Sona Masuri rice work for this? Or Basmati? You can use Sona masuri rice and I use a non stick pan for making dosas. Sometimes I also use a cast iron pan .do try making this.